You can create profiles to organize your boards by user. 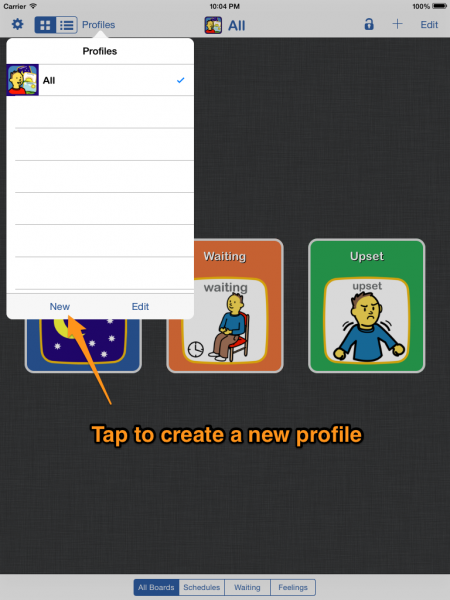 This is helpful when using the app for multiple children, in a classroom setting or if you have a large number of boards and you need more control on how to organize them. 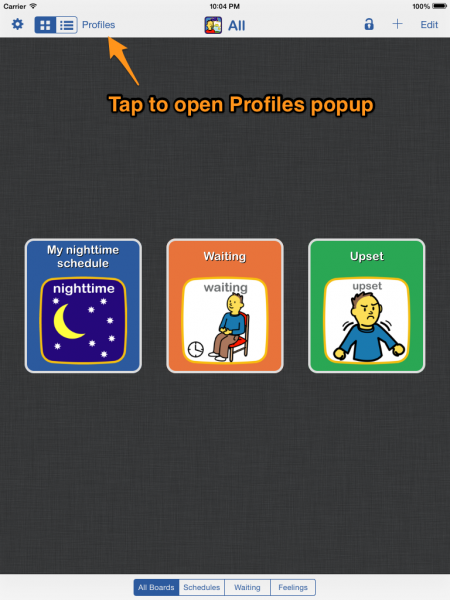 Tap the "Profiles" button from the app main screen to open the Profile popup menu. Tap the "New" button at the bottom of the popup to create a new profile. Tap the "Name" field to set the profile name (required). Tap the "add photo" box to set a personal photo for the profile (optional). Save when done. The popup will close automatically. You must set the new profile as the active profile to start using it. To do this, re-open the profile popup by tapping on the "Profiles" button on the app main screen. Tap on the new profile to select it as the active one. The currently active profile photo and name will be displayed at the top of the main screen. 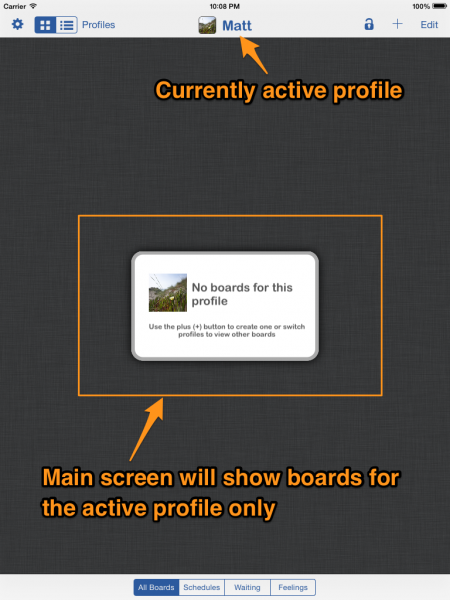 Keep in mind that the app main screen will only show boards for the active profile. If you don't see a board you are looking for, check that you have the correct profile activated. Since new profiles start out empty you will not see any boards listed yet. Any new boards that you create will be created under the profile that is currently active. You can switch back to "All" or to any other profile by returning to the Profiles popup. If you want to copy or move boards from one profile to another, tap on the "Edit" button on the app main screen and use the buttons below the board(s) to complete the desired operation.